Bruce Bowlen built this George Chaisson designed dory tender from information given in John Gardner's "The Dory Book." 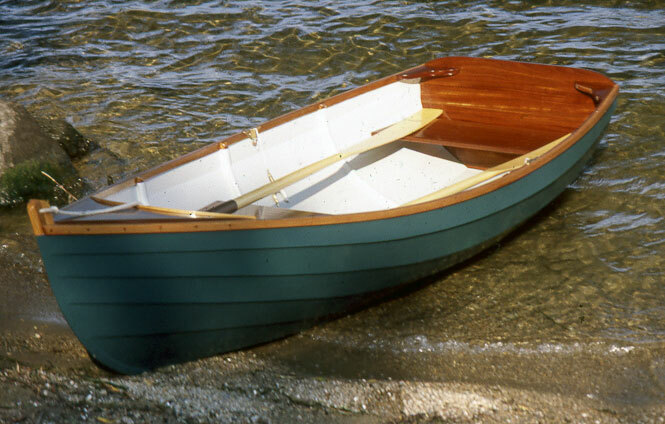 The bottom and planking are made from plywood, stem and skeg from oak, and transom and remaining parts from mahogany. Fastening was done with silicon bronze screws, then the entire boat was epoxied, with a layer of fiberglas cloth on thee bottom for added strength. Launched in July 2001 Bruce rows his dory on Lake Champlain, VT. Contact Bruce at 576 Owls Head Hill, Dorset, VT 05251.